Autoritat del Transport Metropolità (ATM) in Àmbit metropolità de Barcelona (Barcelona and part of Tarragona and Girona). Autoritat Territorial de la Mobilitat del Camp de Tarragona (ATM Camp de Tarragona) in Camp de Tarragona. Autoritat Territorial de la Mobilitat de l'Àrea de Lleida (ATM Àrea de Lleida) in some parts of Lleida. Autoritat Territorial de la Mobilitat de l'Àrea de Girona (ATM Àrea de Girona) ) in some parts of Comarques Gironines. Autoritat Territorial de la Mobilitat de les Comarques Centrals (ATM Comarques Centrals) in Comarques Centrals. Rodalies Barcelona is the principal element of Barcelona metropolitan area transport and in some municipalities of Girona and Tarragona. Renfe Operadora : 6 lines (broad gauge). Ferrocarrils de la Generalitat de Catalunya : 4 lines (standard gauge) 5 lines (metric gauge). Ferrocarrils de la Generalitat de Catalunya: Lleida - La Pobla de Segur line is an old Renfe line that in the first of January 2005 was transferred to FGC. ^ All Barcelona trains start in Estació de França, Sant Andreu Comtal or Barcelona Sants. ^ That line was traspassed to FGC but is operated by Renfe Operadora. Arco García Lorca to Alzira (València). Llarga distància or Larga distancia (in catalan or castilian) are Renfe lines that used other Renfe lines, mitjana distància or Rodalies, and connect Catalonia with other Spanish towns or European cities. Some of them are high speed lines. High speed lines are operated by Renfe in a commercial branch called Alta Velocidad Española (AVE). Those lines run in new standard gauge railways. Barcelona Sants - Zaragoza-Delicias: via Lleida-Pirineus, el Camp de Tarragona. Roda de Barà: Talgo and Brava-CAF systems. Transports Metropolitans de Barcelona: 7 underground lines, one of them in old spanish broad gauge (line 1), the others have standard gauge. (Opened in 1863) Plaça Catalunya - Reina Elisenda. (Opened in 1954) Plaça Catalunya - Avinguda Tibidabo. (Opened in 1912) Plaça Espanya - Molí Nou-Ciutat Cooperativa. Nowadays there are 32 comarcas with some kind of service, 14 of those have Rodalies Barcelona and/or FGC services. There are comarcas that have medium-distance stations or long-distance and 9 comarcas without ferrocarril service. Ferrocarrils de la Generalitat de Catalunya, or FGC, is a railway company which operates several unconnected lines in Catalonia, Spain. Plaça d'Espanya, also simply known as Espanya, is an interchange complex underneath Plaça d'Espanya, in the Barcelona district of Sants-Montjuïc, in Catalonia, Spain. It comprises the Barcelona terminus of the Llobregat–Anoia Line and a Barcelona Metro station complex served by lines 1 (L1) and 3 (L3). On the L1, the station is between Hostafrancs and Rocafort, and on the L3 it is between Poble Sec and Tarragona. The Llobregat–Anoia Line station is served by Barcelona Metro line 8 (L8), Baix Llobregat Metro lines S33, S4 and S8, and commuter rail lines R5, R6, R50 and R60. The services on the Llobregat–Anoia Line are operated by Ferrocarrils de la Generalitat de Catalunya (FGC), whilst the L1 and L3 are operated by Transports Metropolitans de Barcelona (TMB). The R2 is a line of Rodalies de Catalunya's Barcelona commuter rail service, operated by Renfe Operadora. It is a major north–south axis in the Barcelona metropolitan area, running from the southern limits of the province of Girona to the northern limits of the province of Tarragona, via Barcelona. North of Barcelona, the line uses the Barcelona–Cerbère railway, running inland through the Vallès Oriental region. South of Barcelona, it uses the conventional Madrid–Barcelona railway, running along the coast through the Garraf region. The R2 had an annual ridership of 33.6 million in 2016, achieving an average weekday ridership of 125,948 according to 2008 data, which makes it the busiest line of the Barcelona commuter rail service. The R4 is a line of Rodalies de Catalunya's Barcelona commuter rail service, operated by Renfe Operadora. It runs northwards from the northern limits of the province of Tarragona to Barcelona, passing through the inland Alt Penedès region. The line then continues towards central Catalonia, describing a U-shaped route through the Barcelona area. According to 2008 data, the line's average weekday ridership is 105,935, the highest on any line of the Barcelona commuter rail service after the R2. Lleida Pirineus is an important railway station serving the city of Lleida in Catalonia, Spain. It is located between the neighbourhoods of Pardinyes and Rambla de Ferran. 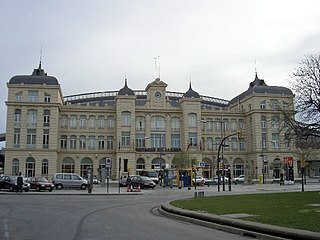 The first train services in Lleida date of 1860, but the station wasn't built until 1927, and it did not adopt its current official name until 2003, when it underwent an ambitious reform. As a transport hub connecting the interior of Spain with the Corredor Mediterráneo, it serves both broad gauge and standard gauge trains, operated by both Adif-Renfe and Ferrocarrils de la Generalitat de Catalunya. It is the terminus of several regional railway services centered in Aragon and Catalonia. 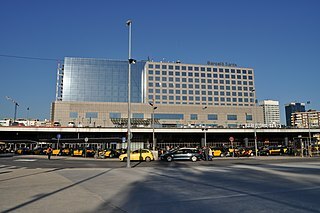 It's also one of the stations on the Madrid–Barcelona high-speed rail line, and it was its north-eastern terminus until 2008. The Llobregat–Anoia Line is an unconnected metre gauge railway line linking Barcelona with the Baix Llobregat, Bages and Anoia regions, in Catalonia, Spain. Its name refers to the fact that it follows the course of the Llobregat and Anoia rivers for most of its length. Plaça d'Espanya station serves as the Barcelona terminus of the line, then continuing northwards to Martorell, where two main branches to Manresa and Igualada are formed. It also includes several freight branches, accounting for a total line length of 138 kilometres (86 mi) and 41 passenger stations. Rodalies de Catalunya is the main commuter and regional rail system in the Spanish autonomous community of Catalonia. It is administered by the Government of Catalonia and operated by the national rail operator Renfe Operadora. The system consists of 17 service lines chiefly centered in the Barcelona area, serving a total of 203 stations throughout Catalonia, with an average number of 1,000 trains running on it every day. In 2016, it had an annual ridership of 117 million.